Josh Eiserike came to the School of Cinematic Arts without much of a plan. 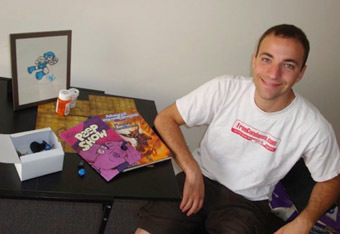 A passionate writer and cartoonist, Josh enrolled in the Production Division. Through his time, Josh found himself writing, directing, producing and basically doing everything that needed to be done. As his time at USC comes to a close, he sat down to talk about his work on a Subway project, staying healthy on set and the importance of building up favors. We like to start with name and proposed graduation date. My name is Josh Eiserike and my proposed graduation is May but that may get pushed depending on my thesis. And you’re Production Division? I’m in production, yes. Let’s start with the Subway project. What’s the pitch of the film? That’s a funny story. I came on to that project the day before the pitch. Separately, I had put together another pitch packet with two good friends of mine – Joel Townsend and David McCraken – who are both in my semester. It was something that all three of us knew Subway wouldn’t want. We loved it but it wouldn’t get picked in a million years. What was the pitch? It was a zombie/stoner comedy, which, leaving drug humor aside, Subway’s a sandwich place. They aren’t going to want something about eating flesh. Surprise. Surprise- we didn’t get picked. But I noticed that two of my other friends, Christian Contreras and Victoria De La Torre, who I had worked on a 546 with, were Subway finalists. I reached out to them as they reached out to me. We found out that I had to be attached before the pitch. Let's take it back a step. For those not at the School, what is a Subway project? The Subway project was something that started a couple of years ago. Do you remember when you would go to the movie theaters and they would show a student Coke commercial? Someone would come on and say, “Hey, I’m Andy Landen and this is my Coke commercial.” Andy was a Coke winner from a couple of years back. He was the last one. They don’t do those anymore. 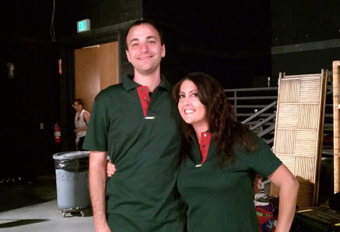 Now, USC co-sponsors a contest with Subway to make a Web series. My understanding is that it serves two purposes. For us, it’s a great learning experience to learn how to work with a corporate client, to do something commercial, to produce more material and to work with a larger budget that we might not have in our other projects. For them, it’s great PR. They get to support the arts. The hope is that it goes viral. What’s the pitch on yours? Mine is called Herman. It’s about a loaf of bread who wants nothing more than to star in a Subway commercial. It’s with puppets, very much like The Muppets. It’s cute. Do you have any advice for students looking to get into a Subway project? What do you think set Herman apart? Herman is an interesting case because it’s the first time Subway picked three USC projects instead of two. They didn’t care for our pitch but they liked the idea. They kicked us a couple hundred dollars to shoot a demo. Advice? Not everyone is going to get a second shot- Christian, Victoria and myself were really, really lucky. But remember that this is for a corporate client and to put your best foot forward. As far as what set it apart I think they were intrigued by the idea of puppets. All in all it was a lot of fun—and a great experience. You’re also a Nicholl Quarterfinalist, too, right? What is the Nicholl? The Nicholl is a fellowship, offered by the Academy of Motion Picture Arts and Science. The Oscars. It happens every year. It’s for screenwriting. Something like seven thousand people submit and around three hundred and sixty were accepted as Quarterfinalists. Of those, the top one hundred are semis and then there are five winners. What’s the pitch of the script you submitted? It’s called Booty Seekers. I wrote it with Mitch Rothenberg. It’s a raunchy teen comedy set in pirate times. How do I put this in a family friendly way? It’s about a group of nerdy kids in 1692 in the Caribbean. They get picked on and one of them is governor’s son. There’s a pirate raid when the governor is out of town and the pirates steal one of the Governor’s prized-possessions. His son has to get it back or he’ll be in deep, deep trouble. I can’t say what it is exactly because this is a family-friendly Web site. But what winds up happening is the three nerds sneak onto the pirate ship and try to steal the prized-possession back. That’s where the adventure starts. In this interview, you’ve talked about producing, writing and directing. Did you identify as primarily anything before coming to School? A writer. I self-published comic books and worked as a professional newspaper reporter for a few years before coming here. That’s my background. Unfortunately, newspapers are kind of done. I wanted job security so I came to film school [laughs]. Producing is something I sort of dumbed into. I didn’t really know what it was. I certainly didn’t know what directing was. When I got into USC, I had no idea what to expect. I thought I was going to meet George Lucas on my first day and he would want to see my script. So without knowing anything, before setting foot in California, I wrote a script. It was, to be frank, terrible. If I’m not mistaken, you were accepted to both the Production and Writing Divisions, correct? I was waitlisted for both. I got off both waitlists around the same time and had about twenty-four hours to choose. Certainly, what I want to do is writing number one but coming to the Production Division was the best choice for me. It might not be for everyone but it was the best for me. I got to produce. I got to direct. I found out I never want to edit or sound edit ever, but I met people who are great at that who I can work with in the future. Also, that terrible script that I wrote that I thought I was going to give to George Lucas on the first day… By the way, prospective students, you aren’t going to meet George Lucas on the first day and please don’t give him anything. I’m sure he’s a nice man but he doesn’t want to read a hundred scripts from first year students. He’s a very proud alum but he’s pretty busy. He’s got some things going on. But the fact that I had written a feature before coming to school set me apart. It was terrible, but at that stage, when you’re first learning the craft, that doesn’t matter as much. There were plenty of production students who said, “I’m going to write a feature” and they don’t. They’re thinking about writing a feature. But at first, I couldn’t get anyone to read my terrible script. What’s funny is that it was the Writing Division students who ended up reading it and giving really great notes. It got better- a lot better. Because I was in the production division, I knew Stephen Gibler, who co-produced the 546 I wrote- (and won the First Look Producing award along with Emily Ferenbach - He optioned that script, which is now much better and my favorite thing of anything I’ve written. So, we’re going to make a movie. With or without George Lucas. So, you were an aspiring writer. How many aspiring directors were in the Production Division? All of them. Including myself. I didn’t know what a director was but I wanted to be one. I would say the majority of people come in wanting to be a director. My only film background before coming to school was that I was in the Back to the Future fan club when I was ten. I had a membership card and everything. What I learned is that the producer makes the movie. The writer makes the movie. The editor makes the movie. The sound designer makes the movie. And so on. I love writing. That’s my passion. I like producing. I like working with puppeteers. I like working with crews. I’m still exploring directing. I didn’t have the best experiences in my 508. For my thesis, I’m going to make something for the Web to direct one more thing. If it goes bad, I’ll never direct again. I shouldn’t say that. Of course, I’ll direct again. What’s one lesson you learned the hard way that incoming students can learn. What’s your cautionary tale? Your 508 films aren’t the end of the world. You make them in your first year and you’re never going to look at them three months later. It was a tough semester. Just make something that’s meaningful to you. How do you strike a balance, because you want to care about your project? You’re making it within the confines of the class. There are really strict deadlines. You work in trios. The DP must camera operate. You have to shoot on certain days. It’s rigid. It’s to teach you discipline as a filmmaker. Do you agree with that philosophy? I do. What happens on the student level is that – it’s the first thing you really make outside of 507 – you feel like your films in 508 will set your reputation at the school for the rest of your time. That’s not true. You’re going to build and wreck and build and wreck your reputation for years. Through all of it. Through your career. My advice is to be collaborative. When I first got here, I couldn’t get anyone to read my script. Now, I know people that will read my script and give notes. Which I gladly do for them in return. It’s especially hard as a producer because you’re constantly calling in favors. You feel like you never give them back. So, your advice is to crew on everyone’s film so that everyone owes you? I know you’re joking, but yes. I would say build meaningful relationships and true friendships so that you have people to rely on. Who are the professors that influenced you the most? There are too many but John Watson. He’s been the mentor on almost everything I’ve done here. It sounds silly but he does a run after 546. The class runs around the track. It’s exercise. It’s good. I remember our assistant director in 546 called an emergency meeting during the run. It was about a company move that weekend. It was fine. I ran every week. We had a great production. I felt great. I felt healthy. That stuck with me. There’s a reputation that directors live off of pretzels and coffee on set. I don’t drink coffee. If the crew sees me with coffee we’re in trouble. The other one is Nina Sadowsky, my producing instructor. I was having a hard time working with a director as a producer in 508. This project was very ambitious and the director was a friend of mine. A great director but they wouldn’t commit to a decision. Nina said, “Give people options A and B. Not A, B, C, D, E, F and G.” I did it and it worked. The project went great. What’s next for you? We have a pickup day for Subway because one of our actors got pneumonia. The glamorous life of a filmmaker. It happens. I’m shooting my thesis. Which is going to be short, funny and for the Web. Can you do a Web thesis? Are you blazing a trail? Well, I’ve been talking to the advisors. They are aware of my intentions. I’m also writing something to follow-up on Booty Seekers. It’s another raunchy teen comedy, this one set in modern times. It’s called Sexiled. I’m also writing a horror movie and a new comic book. I’m going to be busy [laughs].